At Telford Shopping Centre, the popular Christmas Charity Gift Wrap has made a return; and this year one of the participating charities is set to get an even bigger boost thanks to the family of one very festive store manager. Martin Stanton, manager of Stormfront, has been busy helping to decorate the outside of his Father’s home on Freeston Avenue. For the last month, Martin and his Father, John, have been putting up hundreds of lights, inflating an array of snowmen, getting Christmas trees into position, and fixing reindeer in place to transform the outside of the home into a winter wonderland. Martin explained: “For the past few years, my Father has decked the outside of his house in Freeston Avenue with lights and decorations, and every year interest has grown with people coming from far and wide to admire the display. As a regular supporter of the Midlands Air Ambulance, my Father decided that this year he would ask those who visit the house to see the lights to make a small donation to the charity. 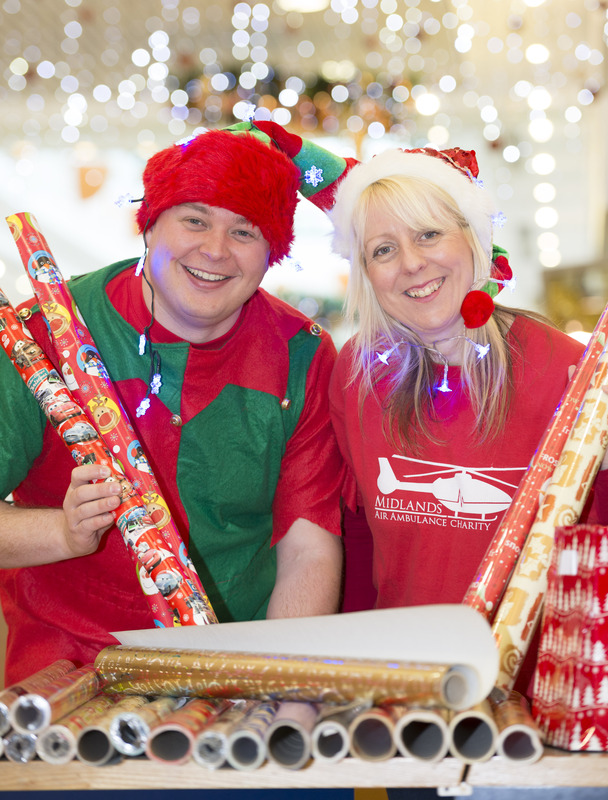 The Midlands Air Ambulance is one of four charities taking part in Telford Shopping Centre’s Christmas Charity Gift Wrap. Situated in New Street, outside 99p Store, the Charity Gift Wrap is now open through to Christmas Eve and it is being run by volunteers from the charities. Chris Jones, Centre Director at Telford Shopping Centre, said: “For a minimum donation, which will be set by the individual charities, visitors to Telford Shopping Centre can now get their Christmas shopping wrapped-up before they head home. Not only will this save the time and money usually spent on getting gifts ready to put under the tree, it will also help four very worthy charities to raise much-needed funds. As well as running the Christmas Charity Gift Wrap from Monday 16 December to Tuesday 24 December. Santa’s Grotto is now open until Christmas Eve at Telford Shopping Centre. Prices start from £3.75 to meet Santa and receive a gift, £5.50 to meet and have a photo with Santa, and £7 to have all three. For further information on Christmas at Telford Shopping Centre, including opening times, please visit www.telfordshopping.co.uk.